One of the great things about Netflix, is it can allow us to experiment with movies. Oh, sure, we could do that at the big blue & yellow video store down the street. However, they would never carry a film like "Tae Guk Gi: The Brotherhood of War" (also at Netflix). Nevermind that it was the single most successful film in the history of Korean cinema, it isn’t going to rent much here in the states. However, Netflix has that whole long tail thing going, so it can afford to carry the low volume discs in addition to your Hollywood bankbusters. 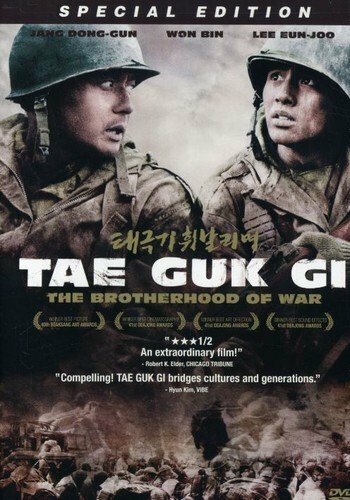 I had read some good things about the Brotherhood and I thought that it might be interesting and educational for Angela and I to watch a film about the Korean War as told from a Korean perspective. Well, a South Korean perspective, at least. Before you start thinking way off track here, any Korean-American politics are left out of the film completely. The characters seem to be thankful, by almost indifferent to the Americans. One scene in the film contains some American military big-wigs who remain nameless. No, it focuses far more on how the Korean war was forced on the people living south of the 38th parallel in 1950. If you believe the film, and I’d say it gets this right, no one in the country went without being deeply and forever affected by their civil war. So many reviewers keep comparing this film to Speilberg’s "Saving Private Ryan," the soaring WWII epic which begins with a marvelous and horrendous sequence depicting the invasion of Normandy. I can understand why, but the films quickly set themselves apart. Where Ryan is a soaring war epic with ensemble casts, Brotherhood is the intimate story of two brothers trying to stay close while everything they know is being torn apart. Ryan has all the traits the we westerners love in our heroes: strength, compassion, and valor. Brotherhood allows it’s hero to sink into darkness, allowing the senselessness of war eat away at his mind. This film is told with the operatic style typical of Korean cinema and television. The characters seem like raw nerves compared to Tom Hank‘s cool and collected Captain Miller; they cry and wail in a way that seems unseemly to western sensibilities. However, this over-the-top emotional expression also allows the viewer to become attached to the characters where their back story itself leaves us wanting to know more1. Cinematically, the film is wonderful. The battle scenes, while sometimes hard to follow, are brutally real (except the CG airplane crash, that wasn’t too convincing). The vast landscapes of Korea that serve as backgrounds show us just how amazing this mountainous peninsula is. One scene of the younger brother chatting up a boyhood friend on a mountain side, while snow flurries all around them, could be slowed into a series of 24 postcards per second. One aspect of the film which I had not counted on, was the political commentary on the ideology of the war. Many Koreans were simple villagers during this time, insulated by their work and small lives. They new little to nothing of governmental ideology and political parties. When offered favors or goods for signing papers or showing up at rallies, they gladfully accepted. Why not? The film touches on this in a major story arc that I won’t get into here, other than to say that one of the characters meets their end because of their unwitting alignment with the "wrong" party. My wife’s maternal grandfather was considered to be one of the wisest men in his small village. He had gone across the Eastern Sea to study at a university in Japan, which was remarkably rare in those days for a Korean. He was routinely asked to help local villages and people, since he could read and write and provide aid in legal matters. He had left instruction with his family to never affix his seal or sign his name while he was away, knowing that unscrupulous people representing both communist and democratic parties could take advantage of his name and influence. However, in exchange for something (know one seems to know what) or at the lie that he had asked his family to do so, a family member did just that one day while he was away. Not long after his return, the rival political faction murdered him as a traitor upon learning of his new-found "alignment." This resulted in my mother-in-law and her family being forced to flee for their lives. So now you can understand just how difficult it must have been for Angela to watch as similar events unfolded in this film. So often we watch, with detached concern, as the tragic events in a movie unfold. However, when the characters fate is the same as one of your very own family members, it becomes impossible to think to one’s self that it’s only a story. Angela watched the film, in tears and visibly shaking with hurt and rage. I never imagined that a film could truly hurt anyone, but I now know that some things are too painful to see realized like this. I had heard of similar stories of former GI’s breaking down and sobbing throughout "Saving Private Ryan.&qout; I can now understand a little more about what they must have felt, reliving the most horrendous moments of their lives. Moments that even the strongest of people can barely make it through and ever wish to see another day. I think that is what these two films have the most in common: the ability to give us all a small glimpse at what these people survived, even if told in two dissimilar ways. Angela did make it through the film, although she did describe it as the single saddest film she’s ever seen. I’d tend to agree with her2. We also agreed that I owed her a number of romantic comedies to make up for it. I honestly can’t say that I enjoyed this film at all, although I did find it to be a great movie. I would recommend it to anyone who wanted to know more about what the Korean war must have been like for the people of that country (now two countries, still technically at war without ever having signed a formal peace treaty). It also helps to understand Korean culture and heritage some, both from the characters as written and the very foreign (to westerners) way in which they are portrayed. I think I understand my mother-in-law a bit better now, and I know that I have even more respect for her than even before, which is to say a lot. Author Jason ColemanPosted on Saturday, December 17, 2005 Tuesday, December 20, 2005 Categories Bookshelf, FilmLeave a comment on "Brotherhood of War"